This recipe for Cauliflower Fried Rice is the perfect way to end a busy day. It’s light, hearty, and absolutely full of flavor. 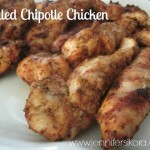 You know those days that are hectic and busy and you just want a super quick dinner that completely hits the spot? My recipe for Cauliflower Fried Rice is one of those meals. I’ve been trying really hard to up my vegetable intake since I am eating better and focusing on my nutrition. Making this dinner though literally only takes about 15 minutes — and is a great way to clean out leftovers out of your refrigerator. 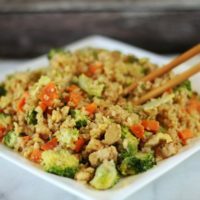 I had some broccoli, carrots, leftover chicken and some green onions in the refrigerator that needed to be used up, so I created this fantastic recipe using Jolly Green Giant Frozen Riced Cauliflower. You can find it in the freezer section at the grocery store. Thanks to Green Giant for sending me coupons to use — I’m sold! If you keep a well stocked pantry at home, you will be able to whip up meals like this all the time. In fact, Kayla and I have come up with SO many meals just by ransacking the freezer and refrigerator. 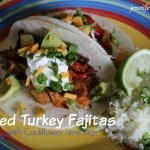 Some of our favorites are our Turkey Lettuce Wraps, Grilled Turkey Fajitas and more. 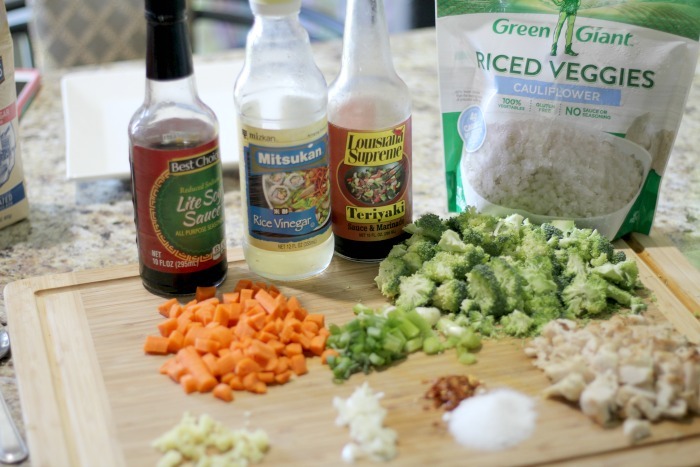 You can use literally any veggies in a fried rice dish. Some of my favorites are garlic, carrots, broccoli, green onions. And for spices we used ginger, salt, and red pepper flakes. The added flavors of lite soy sauce (to cut your salt intake) and rice wine vinegar as well as sesame oil make this one of the most amazing dishes you will ever make. So — here’s how I did it. Green Giant for the Win! Start by sauteing your carrots, ginger, and garlic in 1 tablespoon of olive oil. Do this for about a minute. Then add in your package of Green Giant Riced Cauliflower. I just add mine straight from the freezer – no thawing needed. Give the cauliflower a few minutes to thaw in the pan and dry out some of those ice crystals. Then start adding in your veggies, chicken, spices, and sauces. Cook it until you get most of the liquid cooked out and absorbed in your food. If you want to add in a scrambled egg (because most fried rice dishes have that), you can do it here. 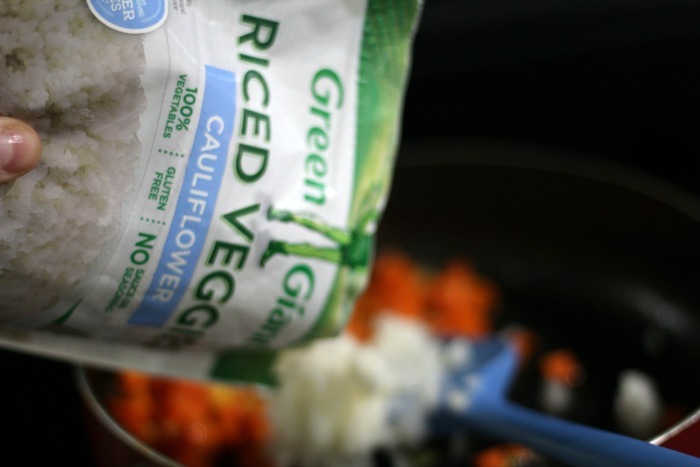 Making cauliflower fried rice for lunch today featuring @greengiant riced frozen cauliflower #ad recipe coming soon! Then, just serve it up in your favorite bowl with some chopsticks if you are feeling fancy — or you can be like me and just eat it with a fork. Beat egg in a small bowlwith a fork. Season with salt. Add the sesame oil and saute carrots, broccoli, green onions, garlic, chicken (if adding)and ginger about 1-2 minutes, or until soft. Raise the heat to medium-high. 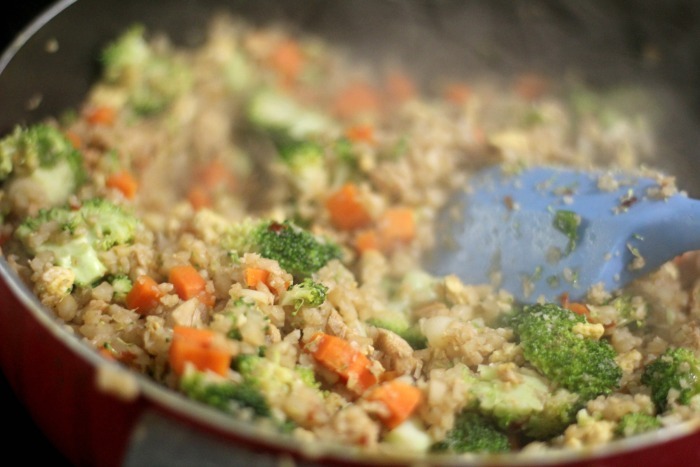 Add the cauliflower "rice" to the saute pan along with soy sauce and rice wine vinegar. Mix, cover and cook approximately 5 to 6 minutes, stirring frequently, until the cauliflower is slightly crispy on the outside but tender on the inside. Add the egg then remove from heat and enjoy! This dish is fantastic, but you want to know what else is amazing? The Cauliflower Veggie Tots that they have. 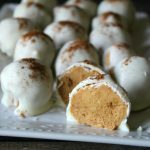 I tried these along with the broccoli tots while at Mom 2.0 in May and oh my goodness y’all! I knew these would be a staple in my freezer once I got home. 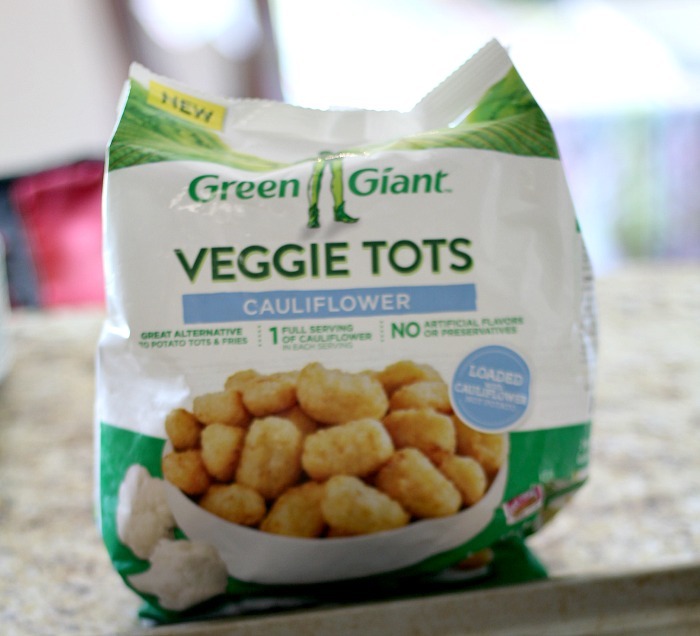 My cauliflower hating husband loves these veggie tots. He said they are really good. For me, that is a definite win because now I can get a serving of veggies down without him scrunching up his nose. Be sure to click over to the Green Giant website and check out ALL the new veggie products they offer. 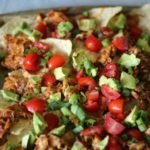 Chipotle Chicken Nachos - Dinner in Less Than 15 Minutes! 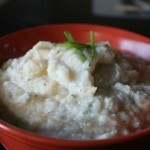 I am totally in love with this riced cauliflower! I’ve been using it in place of race for about a week, and so far the family loves it just as much as real rice. Green Giant has been a part of our family for decades! 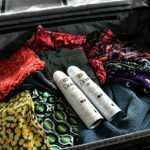 Great brand! You know I am not a huge fan of rice but THIS dish looks SO GOOD! Cauliflower is the new faux-carb! I absolutely love this veggie because of its versatility. 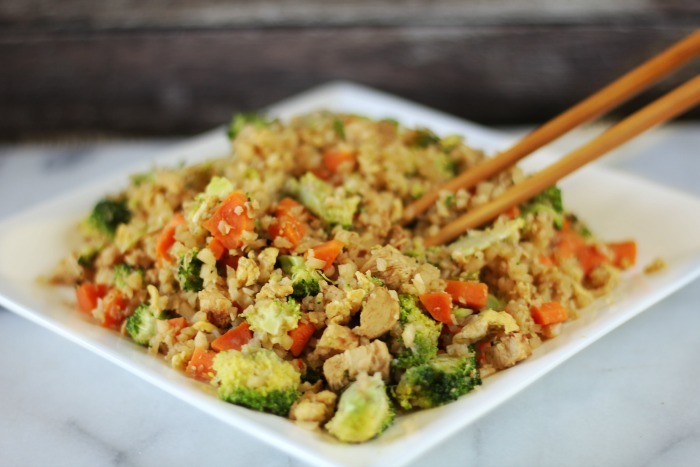 I gotta try this fried rice – looks so healthy and delicious. This looks and sounds delicious. 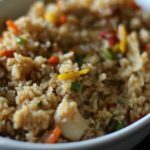 My husband and I both are big fans of cauliflower rice, so I’m guessing we would both love this, too. 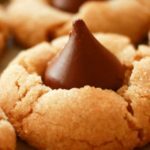 I definitely need to try these. I was trying to make cauliflower rice with fresh cauliflower and the consistency was mushy and weird. I heard that this frozen kind is really good! Wow! 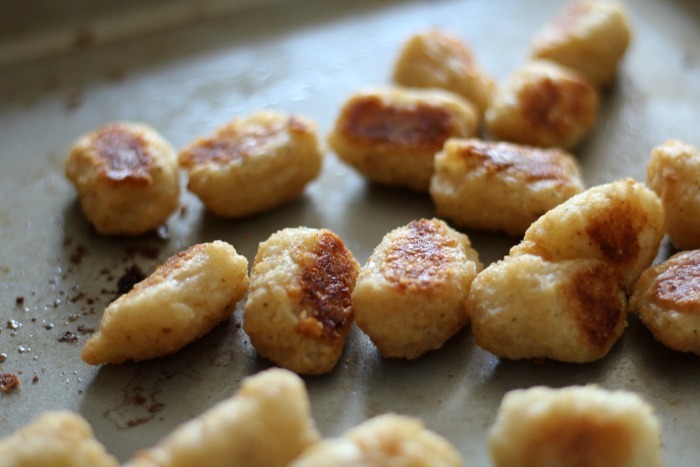 I want to buy those veggie tots! I think this would taste amazing. I’m a big fan of rice and cauliflower! I know a couple of people that substitute diced cauliflower for rice. It’s one dish I have never tried. I do love this stuff. It is so nice that these days you can pick up a bag rather than grating the cauliflower yourself. 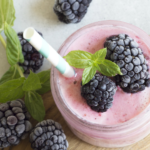 I am all about healthier options and this is the best! 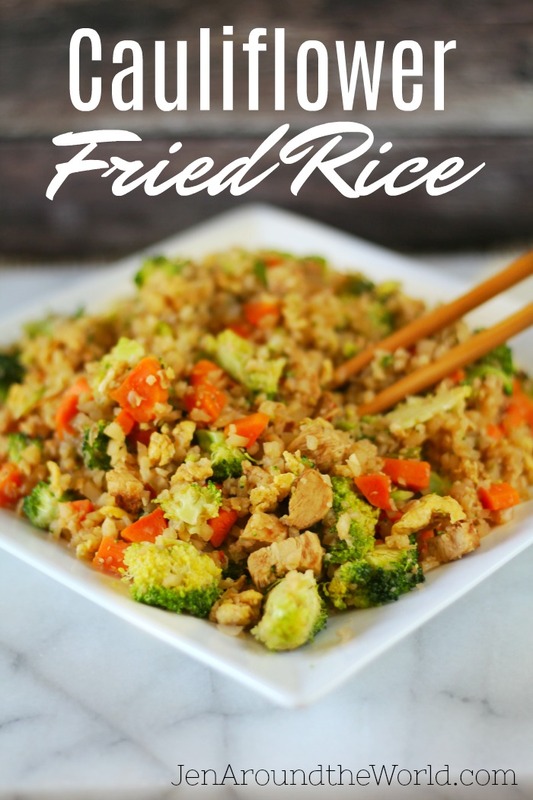 This looks absolutely amazing and a healthier alternative to regular fried rice.